I have this one girl friend, she’s like family, I met her working at the salon I was at for over ten years. One thing that happens when your a hair dresser is that the people you work with become your family. Some you can’t stand, while others you love more than anything, yup it’s one big happy and dysfunctional family. I wouldn’t trade some of those memories for anything, but some of the memories I’m glad to erase; it’s a tough career to stay in with all the ups and downs the industry goes through. I loved being a hair stylist, but due to my spinal injuries after delivering my son Maxwell it is no longer possible. If I didn’t love this dear friend of mine enough; we were texting one afternoon about my new recipe The Best Waffled Zucchini with Lemon Cream Sauce, she then proceeded to tell me about this very recipe, Zoodles with Turkey Meatballs in a Roasted Red Pepper Sauce. Simple, amazing, fresh, delicious I can go on and on. She added that you can use precooked meatballs or make them fresh. So, naturally I used my favorite turkey meatball recipe and made them from scratch. The best part you can always make the meatballs ahead and freeze for later. By using frozen meatballs you take this thirty minute meal and turn into a fifteen minute meal, WOW easy right! 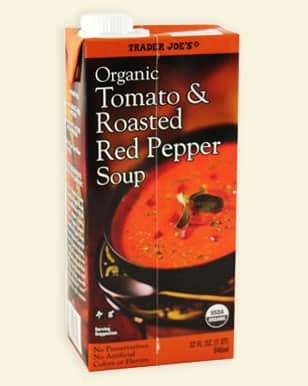 Now, for the that delicious sauce, you absolutely need to try this Organic Tomato & Roasted Red Pepper Soup from Trader Joe’s. The flavor is definitely not your typical box soup, it surpasses any other boxed soup that I’ve tasted. You may also substitute with your favorite tomato soup of choice, but I’m highly recommending you try this one. I mean look at that plate, don’t you want this Zoodles with Turkey Meatballs in a Roasted Red Pepper Sauce right now! I already own this amazing KitchenAid Professional 600 Series 6-Quart Stand Mixer, another kitchen must have for myself. You can purchase a spiralizer attachment that attaches right on the front of the Kitchen Aid Stand Mixer. The attachment was so easy to use and made zoodles(zucchini noodles) within seconds. I secretly can’t wait to use this bad boy in the fall to make home made apples sauce.